With great pleasure, I would like to introduce to you a true master of contemporary Chinese ink & brush artist Mr. Gong-Kai Pan 潘公凱. Mr. Pan is invited by San Diego Museum of Art in Balboa Park to an exhibit of six of his new paintings created for the Museum, the most prominent work is over 45 feet long, created with ink on rice paper, exemplifies the combination of classical brush and ink techniques and format in a contemporary context. Mr. Pan is an acclaimed artist in China, he was the president of the most prestigious art school in China 中央美術學院. He has educated and influenced many generations of young artists today. Introduced by one of our life members Ping Hui Lee 李屏慧, we are very fortunate to ask Mr. Pan to give us a speech while he is here. His topic is 談談中國畫的筆墨. We are going to witness and learn how he 'd embraced the rapid economic growth of China yet kept a strong sense of Chinese tradition all expressed in his art works. 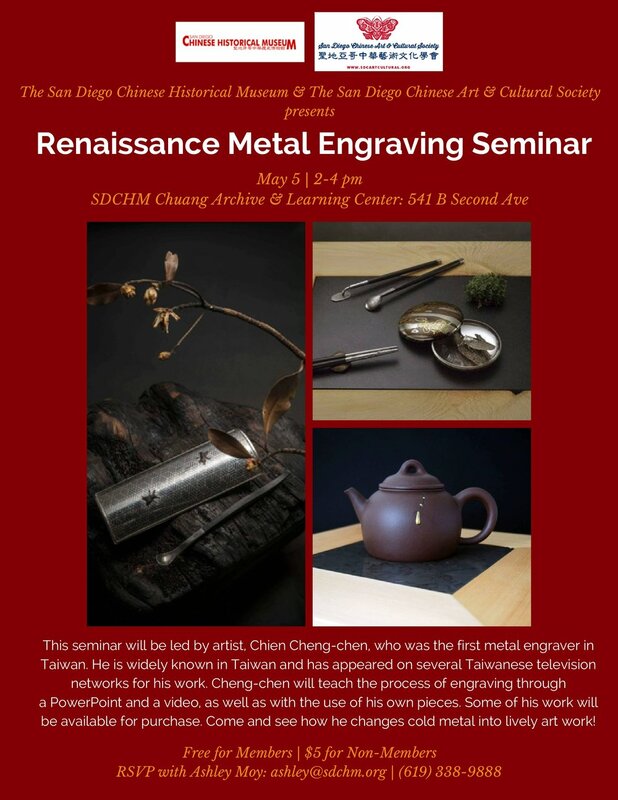 This event is a joint effort by SD Chinese Art & Cultural Society and San Diego Chinese Historic Museum. Please don't miss this wonderful opportunity to meet a true master and do bring your questions for a lively discussion. A note to all members who are concerned with parking in downtown area, SDCHM has secured adjacent parking lot just steps away from the Chuang Archive & Learning Center with a small fee of $10 for our event. Car pool is highly recommended (please see the attachment). Please RSVP to me by April 15. Thank you very much. A very interesting program by the Chinese master painter Wu Yi included the pleasure of viewing a display of six of his original works, two short videos biography and numerous slides illustrating the wide range of his subject matters. He spoke of the deep-seated influence on his work of the Chinese concept of “Xiang Thought” that traces back to ancient times before the development of writing when images were used to record observations and events. The thoughts that were expressed in images evolved into the earliest Chinese characters that incorporated these images into a system of writing. As Chinese ink paintings developed along with calligraphy, the Xiang Thought processes were embedded within the ink paintings, encompassing the long history of Chinese culture and philosophy and a reverence for nature. Wu Yi explained that these elements nourished his understanding of the natural world and allowed him to express the Three Perfections of poetry, calligraphy and painting through his own spirit using brush, ink and paper. The 19th annual International Music and Arts Festival is presented by San Diego Chinese Art and Cultural Society. At 6pm, we'll showcase this year 's winning art works of Youth Painting Competition, with scholarship award ceremony. At 7pm, the popular show will feature an eclectic group of talents, 40 piece orchestra, pianist, Er-Hu soloist (traditional Chinese string instrument), viola soloist, soprano, Latin dance group, chamber music group, accordionist plus Japanese style Taiko drum performance. It will be an unforgettable evening. Field Trip to Disney Concert Hall and Griffith Observatory. SDCACS has a joined event with SD Chinese Writer's Assoc. "A Night with Poet Ya-Xuan". Mr. Ya-Xuan is considered as one of the most important modern poet and influential newspaper chief editors of Taiwan for decades, he shared how he helped to preserved Chinese traditions after Communist Chinese drove Chiang Kai-Shek's ROC to Island of Taiwan.